Some call it a confetti popper or a confetti push-pop, we call it a Confetti Pop! Each Confetti Pop is filled with your choice of biodegradable petal confetti. There is about a handful of confetti inside each Confetti Pop. All our petal confetti is natural, biodegradable, eco-friendly and made of real flower petals. 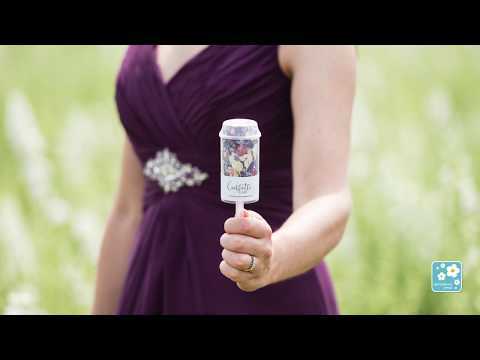 Confetti Pops are perfect for sharing with your wedding guests on your wedding day. They are easy to use, simply pop the top, hold them high and throw the confetti as the newly-weds pass by. Your guests can enjoy playing with these Confetti Pops as a fun alternative to the more traditional confetti basket or pail. Plus you can refuse the pop again and again, or recycle them once you've finished with them. Approx measurements of each Confetti Pop: 18cm (height) x 4.5cm (diameter). Holds enough for a handful of biodegradable petal confetti.